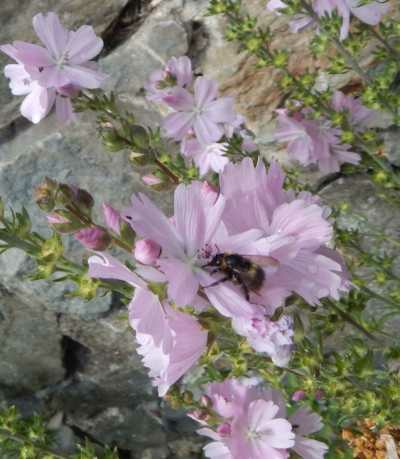 If you’re about to plan your flower border and you are keen to attract bees, then I certainly recommend Prairie Mallow, Sidalcea ‘Elsie Heugh’. It’s loved by bumble bees, honey bees, and a good range of solitary bee species. Like many other members of the mallow family, Prairie Mallow is rich in nectar and pollen, and looks lovely in the middle of the border with other plants, or on its own and planted in a large swathe. It can grow to about 100cm. Ideally choose a sunny spot, though they’ll also grow in light, dappled shade. One thing these plants won’t like, however, is heavy clay around their roots: well-drained soil suits them best. If you sow seeds into pots in spring, then transfer young plants into the garden around May to June you should have spires of pretty, pale pink flowers through the summer. As well as the flowers, you’ll get bees, that’s the best part! 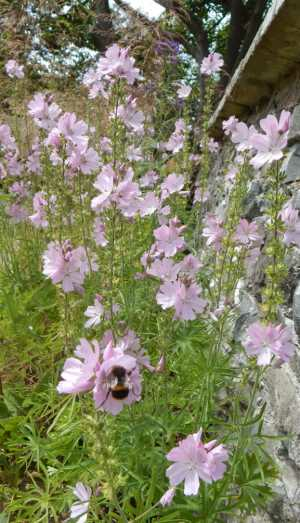 Prairie Mallow, Sidalcea ‘Elsie Heugh’ is also loved by bumble bees. As flowers begin to die off on the stems, keep an eye on them. When there is one flower left at the top of the spike, it’s a good time to cut the stem to encourage further blooms and provide for bees foraging in late summer. 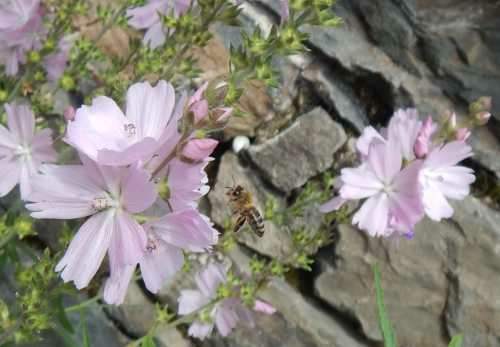 Prairie Mallow has tall, sturdy stems and plenty of flowers for foraging bees. Regular visitors to this site will know I’m a big fan of cottage garden flowers, and Prairie mallow would suit such a border perfectly. Then again, the tall spikes of flowers would look lovely in most borders, partly helped by the fact that the stems are strong and sturdy, so you won’t end up with untidy plants (unlike say, borage and comfrey, both of which are excellent for bees, but look a bit straggly after a while, and spreading of comfrey can be difficult to control). Despite bearing flowers on much of the stem, these plants don’t need to be supported, which ultimately means less work staking, tying, and maintaining. It will also suit gardeners who have a preference for neatness, but want to help bees. Make sure you give plants sufficient space – they’ll spread out in a good sized clump, about 50 cm in diameter, nevertheless, I always recommend planting in swathes as described above, or groups of say, 3 plants. Some may disagree with me, but my advice is to let the plant die back naturally, and resist the urge to clear away old dead stems until after the threat of winter frost and snow is over. The dead plant matter helps to protect roots and young shoots from excess damp and very cold weather snaps. The alternative advice you may read is to cut the plant back at the end of the season, and mulch with grass clippings, bracken, straw or hessian sacking. Personally I find this unnecessary when I leave the old growth in place. Remember To Collect The Seeds! 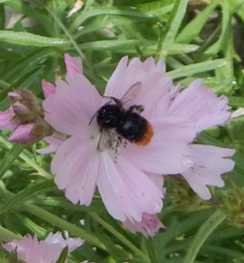 In the Autumn, you can collect seeds if you want to, and increase the area allocated to this wonderful, bee-friendly flower the following year - if not in your own garden, why not ask a friend or neighbour if they'd like the seeds? By giving away seeds of flowers that are attractive to bees, we increase the chance of more people including plants in their garden that are helpful to pollinators.